The Eldersburg Branch and North Carroll Branch are accepting passport applications on behalf of the U.S. Department of State to better serve our customers and to respond to the needs within our communities. Below is the detailed information that you need to know when applying for a passport. The Carroll County Public library does not accept or process passport renewal applications (form DS-82). Persons eligible to use this form should mail it to the National Passport Processing center as instructed on the form. Forms are available at the Eldersburg Branch and North Carroll Branch. If you are planning to travel within two weeks, you must apply for a passport in person at a U.S. Passport Agency or center. Expedite fees apply. Those closest to Carroll County are located in Washington, DC and Philadelphia, PA. You must make an appointment in advance by calling 877.487.2778. Passport processing time may vary depending on the season. Visit https://travel.state.gov/ for actual processing time. CCPL fees may be paid with cash, credit card (Visa, MasterCard or Discover), money order or check in the exact amount made payable to Carroll County Public library. $35 for each passport application submitted. $15 for two passport sized photos. All passport acceptance facilities have standardized fees. The applicant, regardless of age, must appear in person. If a group of family members are submitting applications together, all members must be present before the applications will be accepted. Applicants ages birth to 15 must be accompanied by parents presenting proof of relationship to the minor child; such as a birth certificate or adoption papers. Whoever is listed as the child’s parent must appear. If two parents are listed, one parent may appear with a notarized consent form, DS-3053, and a photocopy of both sides of the non-appearing parent's ID. For applicants 16 and 17 years old, it is necessary for only one parent to be present. Check or money order for Department of State fees. A separate check or money order is needed for each application being submitted. Proof of Identity – valid driver’s license / state ID card / military ID / passport. Learner's permits are not accepted by the Department of State. Out-of-State Residents: If you apply at an Acceptance Facility and submit out-of-state primary identification, you must present an additional ID document, as well. For example, if you apply in Maryland with a Virginia Driver's license, you must present a second ID containing as much of the following information as possible: your photo, full name, date of birth and the document issuance date. One 2”x2” passport photo with a white background. 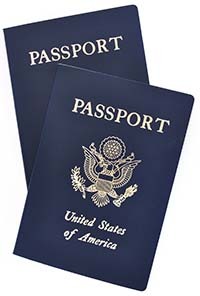 Photographs are available at the CCPL passport center for an additional $15. This fee must be paid separately and should not be included in the check or money order that accompanies the form DS-11. For children deriving citizenship through parents, parents' naturalization certificate, child's permanent resident card and child's birth certificate are required. If the birth certificate is not in English, a certified English translation is required.